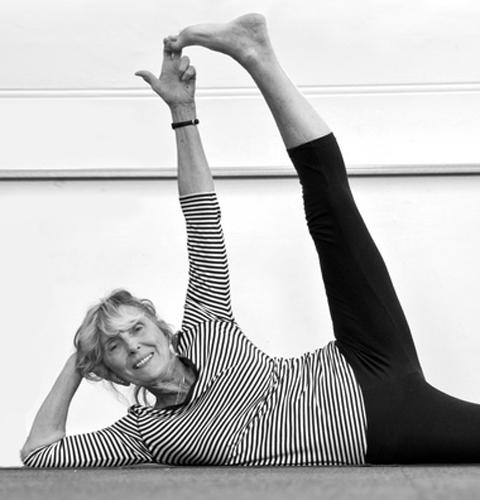 Sheila first became interested in Iyengar yoga while working at Granada TV studios in Manchester in the 70s. Sidney Bernstein, head of Granada TV, thought yoga classes would be good to help his staff (over 2000 employees) cope with the hectic schedule of producing TV programmes. He arranged for a yoga teacher called Pen Reed (senior Iyengar teacher at MDIIY – the Manchester and District Institute of Iyengar Yoga) to run classes in the lunch hour at the huge cost of 20p per session! That was it – she was hooked and found herself discovering the joys and hard work of practising yoga alongside colleagues and actors from Coronation Street! In 1987, Sheila qualified as an Iyengar yoga teacher, gaining her Introductory Teaching Certificate. After some years of study with senior teachers in the UK and the Iyengars in India, she obtained her Intermediate Level 3 Certificate in 1996. In 1997, she became an assessor and soon after that qualified to be a teacher trainer for the Iyengar Yoga UK (Ltd) (IY(UK) Ltd). Sheila went on to study towards her Senior Certificate with advanced teacher Jeanne Maslen (MDIIY) and Judi Sweeting of the Cotswold Iyengar Yoga Centre (CIYC) in Cirencester. 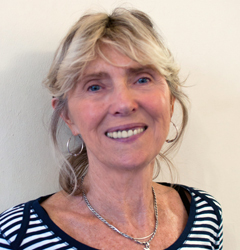 She obtained her Senior Level 3 Certificate – the highest qualification in Iyengar yoga in the UK – in 2006, and was appointed Introductory Teachers Assessment Advisor for the IY(UK) Ltd.
Sheila and Chris (husband Chris works as an arts consultant and is a board member of the Courtyard Theatre in Hereford – and does yoga!) live on a four-acre smallholding in Garway, Herefordshire. 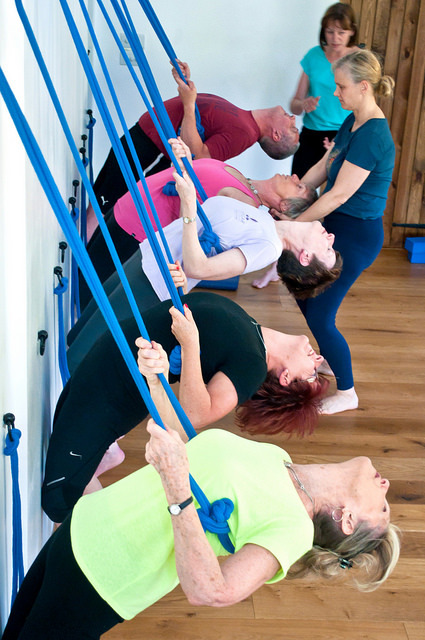 They recently built a fully equipped yoga studio – Herefordshire’s only dedicated Iyengar yoga studio – where, as well as weekly classes, Sheila runs specialised workshops and training courses for students who wish to become teachers and teachers working towards further qualifications. After yoga and a bite to eat, students can relax in the beautiful surroundings of their smallholding, complete with Jacobs sheep, a stream and swimming pool – two lovable black Labradors, George and Gaia, and tabby cat called Menace! Sheila teaches classes at all levels, from beginners to yoga teachers, at her Garway Iyengar Yoga Studio. Mixed ability/beginners classes run on Wednesdays from 9.45am–11.15am and 7pm–8.30pm, and on Thursday mornings from 9.30am–11am. Intermediate classes are held on Monday evenings from 6.30pm–8.30pm. She also teaches remedial yoga at The Haven – Breast Cancer Centre – in Hereford on Tuesdays from 10am–11.30am. Mixed ability classes are suitable for all levels of ability and fitness – would suit most beginners to yoga. Intermediate classes suit those with over two years Iyengar yoga experience. ‘Fit’ beginners will be considered (please enquire). Regular specialised workshops are held throughout the year. Please contact Sheila for dates.